Friends gathered Oct. 5 to remember a peace worker. Photo by Aimee Willhoite. The term refers to the men and women who were children during the Great Depression and fought in World War II. 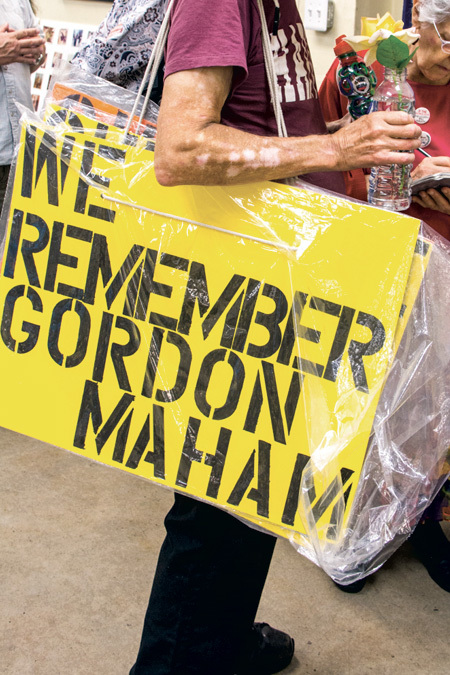 Gordon Maham was a part of that generation, but his life contrasted with that of most of his peers. Instead of contributing to the war effort, which included an opportunity to participate in the production of the world’s first nuclear weapon, Maham opposed war and refused to join the military. Born Jan. 3, 1917, Maham graduated from the University of Cincinnati in 1941 with an engineering degree. With it, he was hired to work with the Army Corps of Engineers on the Panama Canal. Engineering next led him to the top-secret Y12 National Security Complex in Oak Ridge, Tenn. The city was founded by the U.S. government as living space for the employees who would help build the world’s first atomic bomb. Like the majority of his co-workers, Maham did not know his work as a civil engineer was linked to helping to make the weapon. But when Maham learned that the facility’s purpose was to enrich uranium as part of the Manhattan Project to create the world’s first nuclear weapon, he quit his job. With that decision, he lost his war-industry draft exemption and was conscripted to fight in World War II. But just as Maham wanted nothing to do with building the most destructive weapon in human history, he also refused to cooperate with his military induction and was incarcerated in the federal prison in Ashland, Ky. While behind bars, Maham attempted to desegregate the prison. Upon his release, he raised a family of three sons and one daughter for the next 40 years. He eventually joined the Cincinnati Community Church, led by the Rev. Maurice McCrackin, a Presbyterian minister excommunicated by that denomination for refusing to pay federal income taxes in protest of the funding of the U.S. military. A jail cell became a familiar scene for Maham. He was arrested and jailed for protesting against his former employer in Oak Ridge, Tenn., on numerous occasions, insisting that the production of nuclear warheads be halted. The video showed Maham being arrested for trespassing at the Oak Ridge facility to protest the production of nuclear weapons. He was arrested at least 16 times in Oak Ridge, protesting against the facility twice per year for eight consecutive years, according to Brian Garry, an anti-war activist and former candidate for Cincinnati City Council. Garry, who organized the memorial service, considered Maham a father figure. Maham was one of the most important people in his life, Garry said. About 60 people gathered at St. Joseph Church to remember Maham, who died July 9 (see “A Life in the Resistance,” August edition). Several speakers said he dedicated his life to helping other people and opposing violence. That opposition landed him in jail cells. Berta Lambert, a vendor of both non-profit newspapers, Streetvibes and Article 25 who often sells newspapers on Ludlow Avenue, accompanied Maham on the Oak Ridge protests and arrests. Lambert noted one occasion when the two men went to the uranium enrichment facility together. After their arrests, the judge presiding over their cases called for Maham. The defendant made fun of his own last name. The pronunciation of his last name is ironic for a man who sought to spread peace, love, non-violence and an end to the development of nuclear weapons. “Even though he was a hard-core protester, he always made sure everyone was included, including the guy that was putting the handcuffs on him,” Lambert said. Ralph Hutchison, a member of the Oak Ridge Environmental Peace Alliance, praised Maham for being determined to peacefully oppose violence, even when facing arrests, fines and cycles of imprisonment. During one sentencing, Maham objected to a fine for trespassing, telling the judge he wanted his money to help the homeless and mentally, ill, Hutchison said. He quoted Maham: “Judge, I think these people could use my money more than you could.” The judge dropped the fine and sentenced Maham to community service instead. “Gordon had a way of schooling people like that,” Hutchison said. Mary Ann Lederer, a local artist and anti-war activist, said she met Maham through his passion for farming. Lederer talked about wanting a vegetable garden, and a woman who knew Maham wrote down his name and phone number and told Lederer to call him. Lederer described calling Maham to discuss building a vegetable garden on her property. Shortly after the call, she found him outside her home building the garden.